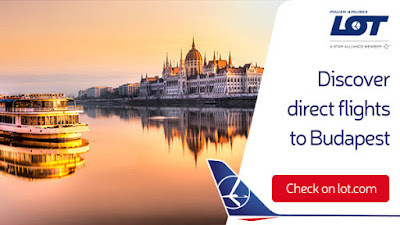 LOT has announced the new direct flight from London City Airport to Budapest, starting on February 18th 2019. The Polish Airline says tickets for the new service start from £135 round trip and will operate twice daily on Embraer Jets. Budapest, the Hungarian capital is one of the largest cities within the European Union in terms of area and population. 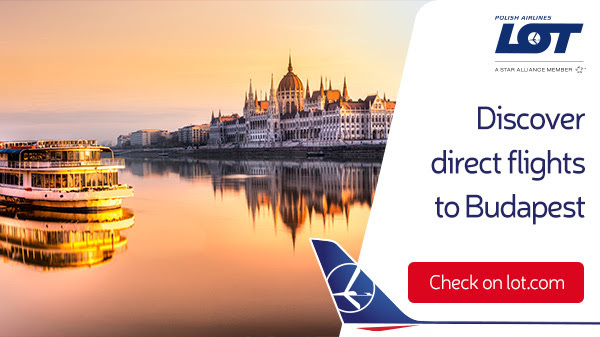 It is also a major tourist attraction as it offers so much for the visitor, including great historic architecture, like Buda Castle, Saint Stephen's Basilica and the Hungarian Parliment building that was completed n 1904. The vibrant city has a great nightlife scene thanks to a cosmopolitan feel created by the locals, visitors and big student population. There are some wonderful eateries, like Cafe Gerbeaud, that focuses on traditional local cuisine fused with more international dishes. The food in many of the local restaurants and cafe is simple, wholesome, warming dishes that will fill you up without costing a packet. The culture vultures will love the multitude of museums and galleries within the surrounds of the city - over two hundred of them, so it'll take more than a weekend or so to get around them all. Oh and speaking of getting around, Budapest is particularly well connected with 33 tram lines, 270 bus routes, 4 or 5 metro lines, 5 suburban railway and 4 boat services and even some trolleybuses, oh and don't forget bikes as well! Budapest is one of our favourites destinations in Europe as it always seems to offer so much more than you can ever see or do in a weekend. Most of the locals are incredibly friendly and are very welcoming to visitors to their home city.